Big news and big thank yous! 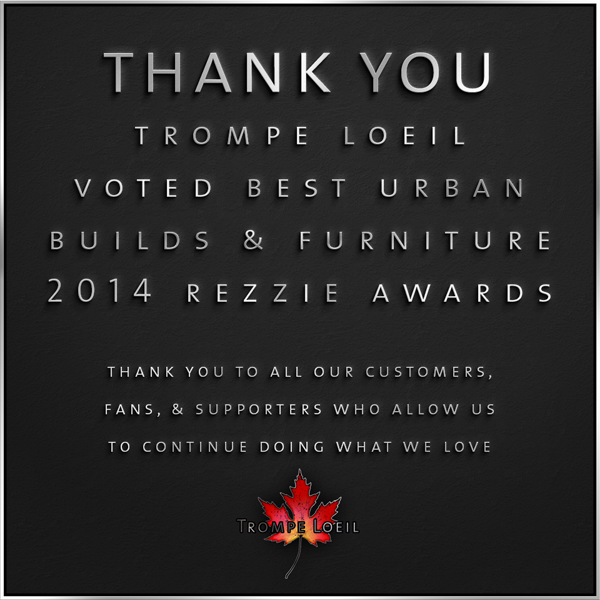 Trompe Loeil has won the 2014 Rezzie Award in the Best Urban Builds/Furniture category! The Rezzies are nominated and voted for by community members just like you – which makes this award extra special to us. Thank you to everyone that voted for us, and thank you to our fans, friends, family, and customers that support us every day and allow us to continue doing what we love every day. It means so much! Here’s to many great years ahead! Check out all of 2014’s Rezzie winners!